18" plastic silver royal scepter with gold accents and faux gems. This scepter makes the perfect addition to any king costume or queen costume. No member of the royal family should be without their scepter. 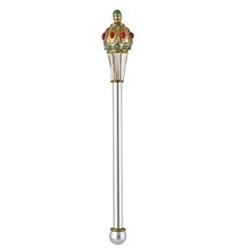 This costume scepter is very popular for both the stage and for dress-up.